This recipe is old-old-old. I think I accumulated this one pre-children and my oldest is now 26. For those familiar with Vancouver, my husband and I decided to try a restaurant that used to be at Granville Island called Isadora's. I loved this eaterie and became a huge fan of their nut burger in particular. Pre-marriage I had been a vegetarian and although I set this aside to allow my family to the freedom of choice, I still was very drawn to interesting vegetarian offerings. One visit I bravely asked the waitress if the chef would share his recipe knowing the answer would, of course, be no. Imagine my surprise when she came with this small, hand written slip of paper with just a scribbled list of ingredients. The other surprise was the quantities. This was for a busy restaurant, so it started with 24 cups of walnuts and moved through 30 eggs. I did manage to downsize it to a level that was family worthy and it's been a hit. For some reason I forgot about this one until the other day. It really is a quick and easy meal if you have a food processor and even my fussiest eater tolerated it. What more can you ask. The only real change was I remember someone commenting that it had way too much oil in it so have cut it in half. - The walnuts need to be fresh. If you've ever left walnuts in the cupboard for a while and then eaten one, the experience is EWWWW! Walnuts get a very strong after taste when they are old and stale. It doesn't matter how many ingredients you add, it will come through. 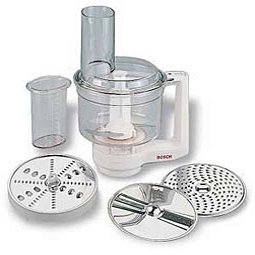 - It is best to have a food processor. I run the walnuts through the grater blade and they come out just right. - A hamburger press is another essential. They aren't expensive and are priceless when working with nut burgers. I have an ancient tupperware system. 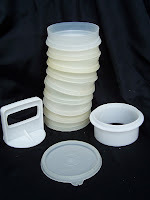 I don't use the storage pieces, just the press and the ring that creates the shape. Then I freeze the extras in a freezer bag with 2 layers of wax paper between them. - Use a cheese with flavour! Whether you want a sharp cheddar or aged Gruyere is up to you. - This makes approximately 12 burgers, so unless you're feeding a family, I would cut the recipe in half. Also, these are thick. You might want to experiment with 1/3 cup size if you have younger kids in particular. Remember, if you are using less each burger this will make more individual patties. For your convenience I have put 1/2 recipe amounts in parenthesis!!! Combine all ingredients and mix well. Shape into patties using a hamburger press and 1/2 cup of mix (1/3 C for thinner patties). Saute on low heat until lightly brown in a non-stick skillet. If you want to add sliced cheese, put on top the last few minutes of browning. 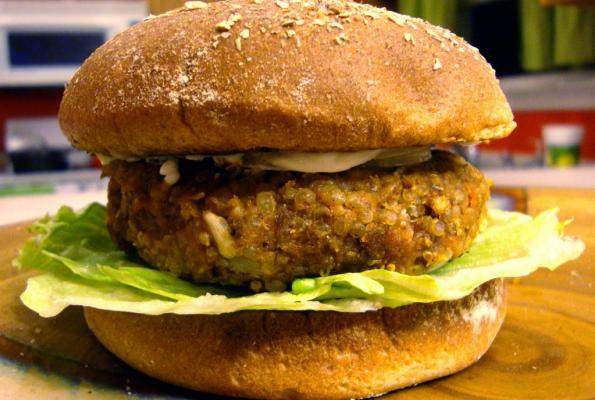 Serve on a whole wheat bun with tomato, lettuce, mayo and dijon mustard. Freeze the extras in a large freezer bag with 2 layers of wax paper between each patty. I hope you enjoy this recipe as much as I did. I feel like Bon Appetit Magazine being able to offer a recipe written in the chef's own hand.